and selected weanling and yearling prospects. Please find details about these colts & fillies below. 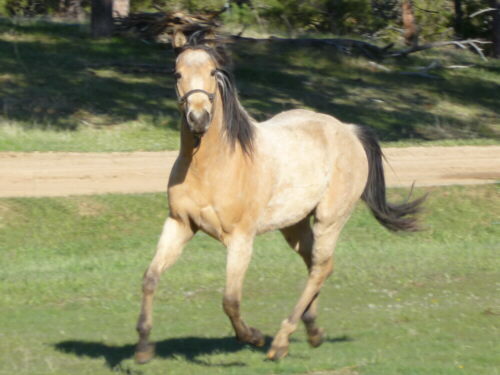 Drifter is a very well build, 14hand Orphan Drift and Sun Frost bred Quarter Horse gelding, beautiful yellow buckskin color. He is halter broke, some ground work done, ready to start under saddle. Only for sale because I broke my collar bone and won't be able to start him this year. He has a friendly, curious personality. He wasn't halter broke until he turned three and became an in-your-pocket-personality. Not spooky but more a laid back kind of horse with a lot of self confidence. Bay stud colt by DUALIN WITH COWS out of CATALENA FRECKLES. He is a half brother of the 2yr old palomino filly we have for sale (Freedom Catolena). 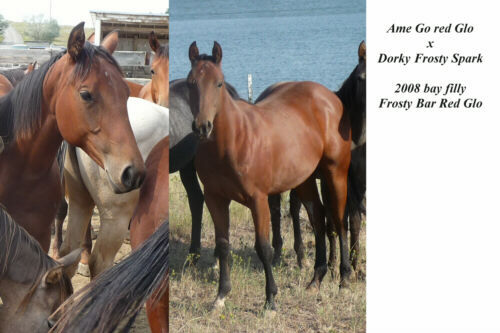 Their dam is broke to ride and was used on the ranch before she joined the brood mare band. She was very easy to train, smart, quick and cowy. This colt will look at a cow and get down to work it. He already shows the quick turns he'll need to be a reined cow horse or excel in the cutting pen. This is a horse that will go all day long discover new trails or get a day's work done at the ranch. She will be tall (expect her to be 15.2hd) and stout as a freight train. 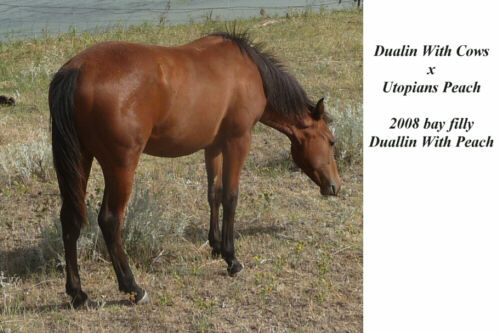 Her full sister was started late under saddle but what a great mind and impressive work ethic! Bay filly by Dualin With Cows out of Utopians Peach. With her sire bred to perform in cow events in the arena and her dam heavily foundation bred she has all the makings to make her run after a cow. This is a gray stud colt by Dorky Frosty Spark out of MB Frosty Pipse. 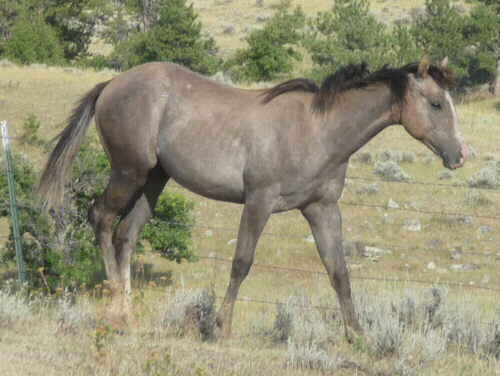 He is a late colt that will quickly outgrow his older half brothers and sisters. His 2year old full sister, also born late, was one of the more developed 2year old fillies we had this year and sold first! Speed bred on top and performance on the bottom makes this pretty colt a prospect for any direction you'll aim him. She is a beauty! 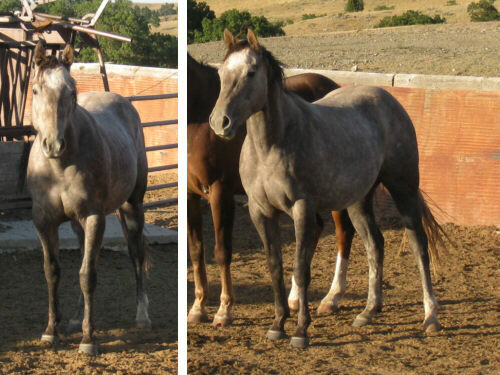 Gray filly by Dorky Frosty Spark (own son of Frosty Feature) and out of Hickory Bella Doc (granddaughter of Doc's Hickory on top and Doc Bar, Doc Olena, Jewels Leo Bars ("Freckles"), Sugar Bars, Jeo and Poco Bueno bred on the bottom). Her pedigree reads like an AQHA Hall of Fame Who is Who. With speed breeding on top and cow breeding at the bottom she's a good bet for a barrel race prospect or get the work done at a ranch. Gray filly by Dorky Frosty Spark out of Smart Jeep, a daughter of our best broodmare Tee Bar Jeep, whom's daughters we always keep in the herd. Even though she doesn't look the part yet: this girl will be a stout, strong mare with lots of cow in her. Take her out and work her at the ranch, discover some trails or swing the rope on her and make some money at the jackpots - there are no limitations for this filly. 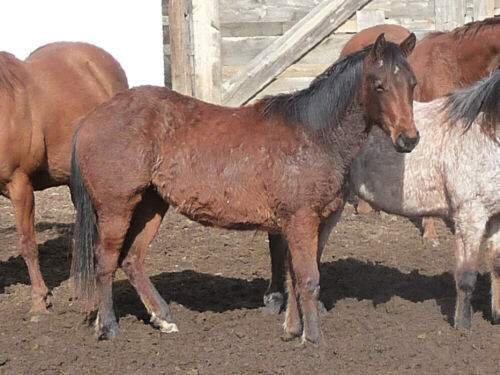 She got caught in a fence as yearling and has some scar tissue on her inner left hind leg. She is sound and we guarantee her sound. This pretty bay filly is by our own son of Dualin Gun (NCHA points, son of World Champion cutting horse Dual Pep). His dam is our best broodmare, Tee Bar Jeep, a mare that throws stout, well build horses which perform great at the ranch and in the arena. 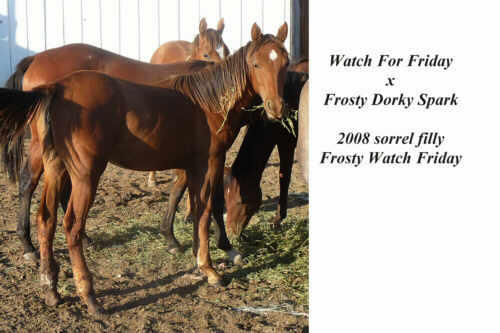 Sorrel filly by Dorky Frosty Spark out of Watch For Friday (Zan Parr Jack on her papers). The pedigree of this filly speaks for itself - with Frosty Feature on the top and Zan Parr Jack and Poco Bueno on the bottom this filly can outrun any cow and look good doing it. Her weanling full sister already sold - too impressive to pass up! 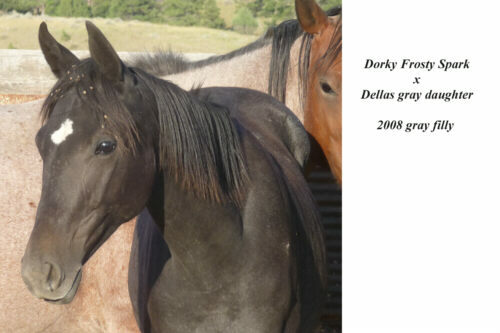 Gray filly by Dorky Frosty Spark out of a grade mare (her dam is proven ranch, trail and kids horse, sire producer of great ranch horses). 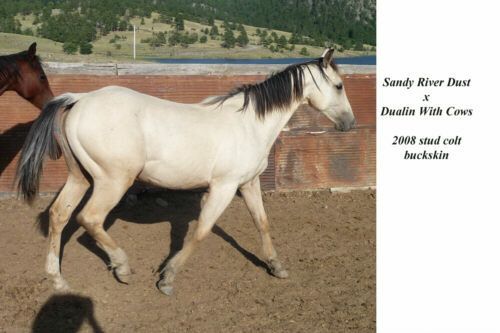 She is speed bred on top and bottom and has the long legs to go with her bloodlines. Buckskin stud colt by Dualin With Cows out of Sandy River Dust. Very mellow horse, loves people. 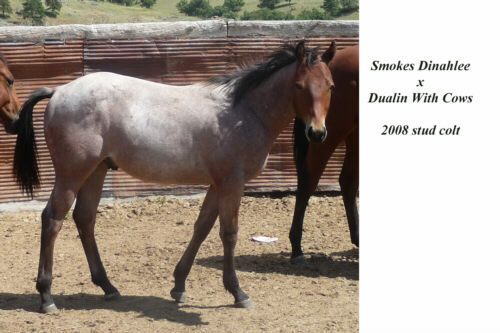 Bay Roan stud colt by Dualin With Cows out of Smokes Dinhalee. This is a cross that produces heavy muscled foals with big hips and beautiful necks. 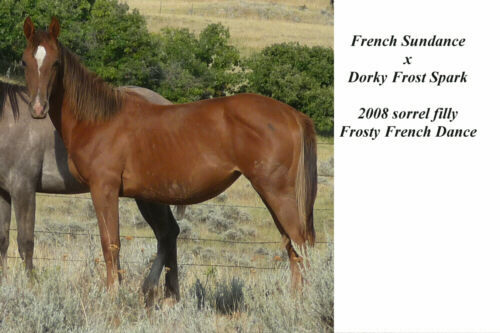 Sorrel filly by Dorky Frosty Spark out of French Sundance. This girl is bred for speed (granddaughter of Frosty Feature, Frenchmans Guy on the bottom of her papers). Sorrel stud colt by Dorky Frosty Spark out of a granddaughter of Frenchmans Guy - due to bureaucratic reasons not registered. This colt is speed bred top and bottom and will run. This granddaughter of Paddys Irish Whiskey (NCHA money earner and producer) has it all: bloodlines, looks and disposition. She is very friendly, loves people and has a light start (a few rides) on her. 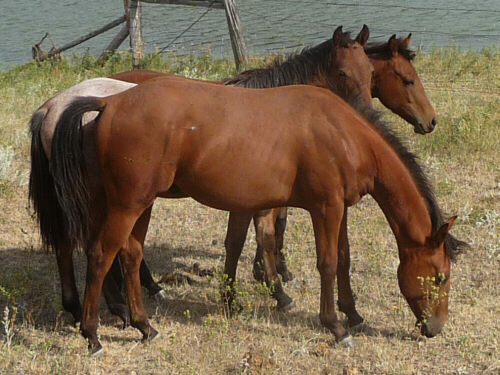 She has Paddys Irish Whiskey, Peppy San Badger, Doc Athena and On A High on her papers, and the fourth generation reads from top to bottom like a Who-is-Who in the Quarter Horse business: Mr San Pepper, Doc Bar, Doc Olena, Texas Gill, Dash For Cash, and Chicks Deck. 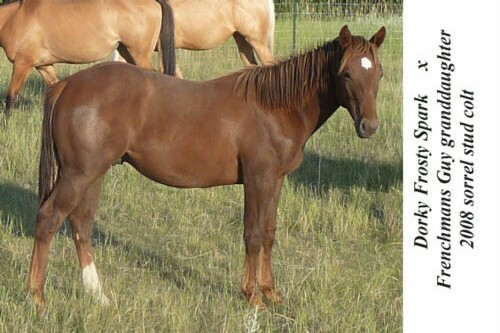 See her complete pedigree at http://www.allbreedpedigree.com - she is registered with APHA. She is out of halter and race bloodlines (sire) and cutting bloodlines (dam). Her dam is only 14 hands tall and it looks like as if Pepper will not get taller than that either - just the perfect size for a catty horse in the cutting ring. She has a correct confirmation, straight legs, good hooves and a very pretty, refined head. Pepper is halter broke and leads even over tarp. She can be brushed and touched everywhere, gives her feet, trims, clips, loads in a trailer and is all around an easy to handle little filly. She really likes people and walks over to visit. Used to cats and dogs. Self confident enough to not getting too concerned of being away from other horses (I can graze her in the back yard while the other horses are out in the pasture without her throwing a fit about being alone). 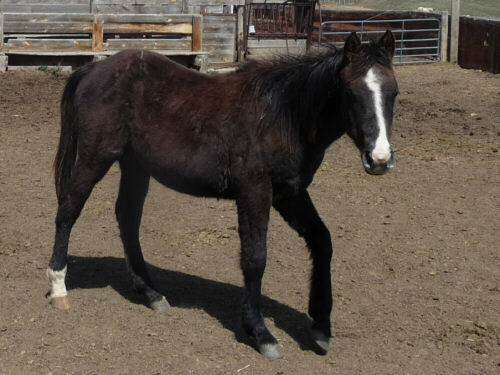 Pepper went to Sundance, WY, and I will make sure that I will visit her and watch her grow up - she sure is one of a kind of a pretty filly! 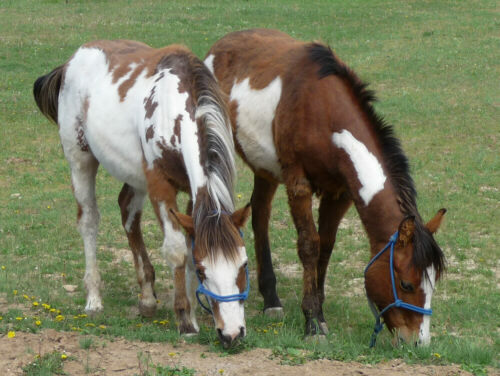 Patches is a bay overo paint filly. 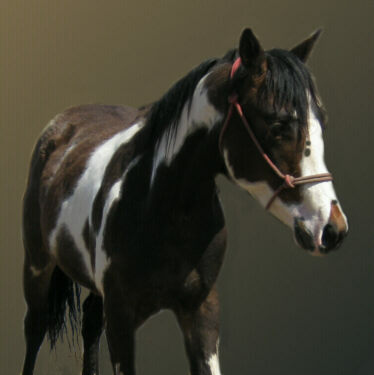 Born April 2008 out of the APHA stud "Frost My Feature" and an unregistered Quarter Horse mare. She can be registered with PtHA. She should mature around 15.1 hands and looks like she'll have some speed. Patches is halter broke and leads even over tarp. She can be brushed and touched everywhere but she is still a bit flighty (handling her only for a few weeks now, she wasn't halter broke as a filly). She really likes the people she knows and walks over to visit. 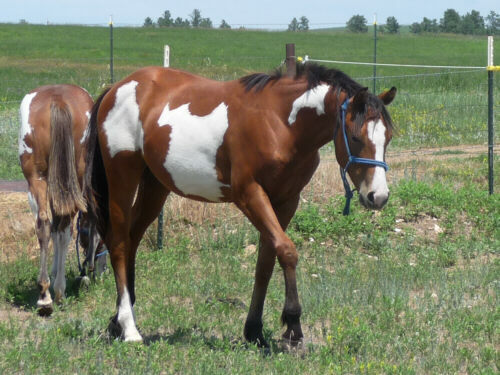 Patches went to Upton, WY, and her new owner has big hopes for her.